Very high quality Road Rider wheels provide maximum speed and make it ideal for downhill ride. The artwork of Lion God Rasta makes it an obvious head turner. Highly affordable considering its features and specifications. Lightweight and easily storable plus very portable. Low center of gravity ensures maximum stability and easy riding. Tough Maple laminate deck provides strength to the board and extra grip for rider. Dimensions: The Santa Cruz Lion God Drop Thru Cruzer Freeride Longboard is 40” in length and 10” in width. These are ideal dimensions for a learner’s longboard. The design on its board is a great piece of artwork made of metal ink. The larger wheels make it an ideal longboard for cruising around the town. 31” wheelbase, Drop Thru design, close to ground board and very stable. Due to extra stability and 75mm Road Rider wheels, its easier to achieve higher speed. Very lightweight, easy to store and carry around. Black Santa Cruz Grip Tape with Rasta Stripe. ABEC9 rated bearings for maximum performance. Very high-quality Road Rider 180 trucks. Longevity: Santa Cruz Rasta longboard is popular for longevity. This longboard is pretty good at lasting long with few wear and tears on certain parts like wheels and bearings. Maneuverability: The wheels of Santaz Cruz Lion God Drop Thru Cruzer longboard are bigger than an average size i.e. 75mm. Despite the larger size, the material is very soft at 78a on the durometer. Also, its trucks and the entire board are kept very soft, this whole scheme of construction makes it highly maneuverable due to its high stability and carving capabilities. Strength and Flex: The 31 inch wheelbase and the 8 ply construction of deck make it an ideally strong board. However, there is not much flex due to the Maple construction of the board’s deck. Bearings: It has ABEC9 rated bearings with very high-speed lubricant to maximize the overall performance results. Though, these bearings are expensive but the performance with these bearings is unmatchable. Affordability: It has a very competitive price if we consider its features. In fact, the artwork in itself is totally worth your money. Replaceable Parts: The best benefit of this Santa Cruz longboard is its flexibility. Its not going to disappoint you, since you can always put in your own preferred bearings, wheels and other parts. Appearance and Styling: If we had to rate it for looks and styling then this Santa Cruz longboard would get ten out of ten. It’s a complete head turner. The Lion God Rasta graphics are extremely captivating to the viewer’s eyes and you can always flaunt your style as well as its unique artwork among your friends and surfing buddies. The Lion God Rasta graphics are amazingly impeccable and beautiful – especially the red, yellow and green colors on the bottom of board are highly eye-catching. Riding experience with this Santa Cruz longboard is very smooth. Speed is unbelievable and there are no speed wobbles even at higher speed rates. Has an increased stability due to low center of gravity. Trucks and bearing are top-notch for efficient performance. Very lightweight, especially its board which weighs around 0.7 pounds only. A minority of customers reported finding bubbles under the grip tape. Its more of a manufacturing defect happened in a short supply of boards and has most likely been resolved. You would need to replace bearings for maximum performance. There can be dissatisfaction with the build quality of the board since there are many other good options in the market for the same price. The fun of tricks can be limited with this longboard, since you can perform fewer tricks with this particular longboard. 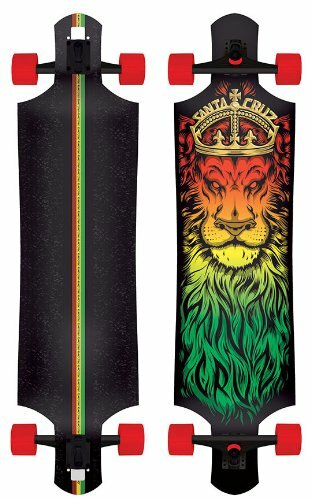 The Santa Cruz Lion God Rasta Drop Thru Cruzer longboard is a great choice regardless of your level of expertise with longboards. Santa Cruz is highly popular skateboard brand, especially known for providing the riders to their heart’s content. Additionally, this particular longboard comes with top-notch components that help you maximize your surfing experience. If you want a very high-quality and well branded longboard then Santa Cruz Lion God Rasta Drop Thru can be your best choice!